Like Reuben sandwiches? Like egg rolls? Here’s a fusion of the two: the filling of a Reuben in a crunchy egg roll wrapper, instead of on pumpernickel bread. If you plan to kick back with a beer or two this weekend, make this yummy snack to go with the brew(s). To make a more formal meal of it, serve with a side of potato salad. The recipe was developed as an appetizer or snack at at Mader’s, a German restaurant in Milwaukee, Wisconsin. Chef Dennis Wegner created them for a summer festival circa 1990. 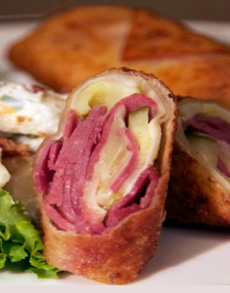 The recipe was sent to us by Dietz & Watson, a purveyor of quality deli products. 1. LAY an egg roll wrapper flat on a work surface. Place two pickle slices toward the bottom end of the wrapper. Top with a portion of corned beef, a portion of cheese and a portion of sauerkraut. 2. BRUSH the edges of the egg roll wrapper with the beaten egg. Begin rolling the wrapper tightly around the filling. Halfway up, fold in the sides, then continue to roll the rest of the way. Repeat with remaining wrappers and filling. 3. HEAT oil to 350°F in a large, high-sided pot. Gently drop in the egg rolls and fry until golden brown and cooked through, about 5 minutes. 4. REMOVE and drain on a towel. Slice on a bias and serve with deli mustard. *Ask for the corned beef to be shaved at the deli counter. If you have pre-sliced corned beef, shred the slices so they’ll integrate into the egg roll filling.